Today, I am preparing classic as well as delicious cheesy dumplings for kids. You can also call these dumplings as meatballs. This recipe is very simple as well as very easy that will not take too long to get prepared. It’s an absolutely delicious preparation that you will love and your kids as well. I encourage you must try them at least once, you will love to make again. This recipe for cheesy dumplings for kids, is very simple to start, soak breadcrumbs in milk for 15 minutes. 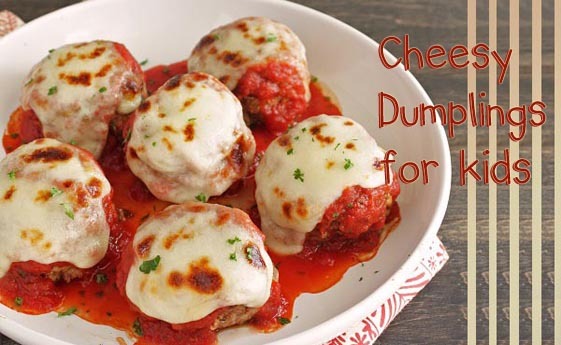 Combine the soaked in milk bread crumbs with the remaining meatball ingredients. Then form balls the size of a ping pong ball. In a deep pan put the oil and let it warm. Fry the meatballs until they are golden browned but not fully cooked. Then, in a separate pot put the oil, fry the remaining garlic and onion. When translucent add the red pepper and cook for 3 minutes. Add the chopped tomatoes, mutton broth, grapes juice, tomato paste, oregano, basil, bay leaves, salt and pepper taste. Bring to boil. Add meatballs and bring to a boil, simmer for 30 minutes. Add melted cheese on top. Put in oven and turn on griller for 5 minutes. Dish is ready for your kids.